Like most South Indian cities, Hyderabad too has its own share of beautifully crafted temples. The history of Birla Mandir dates back to 13 February, 1976. It is located in the south end of Hussain Sagar in Hyderabad. It is positioned at the top the Kala Pahad, the twin small hill of the Naubat Pahad. The temple has been designed with white shining marbles from Rajasthan and surrounded by the beautiful rose garden. The Birla temple is a perfect example of sophistication and spirituality. This temple is dedicated to Lord Venkateshwara. 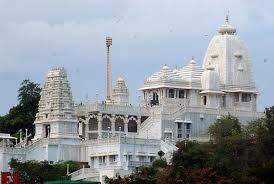 Birla Mandir has brought together the architectural styles of Orissa and South Indian temples. The South Indian style Rajagopuram welcomes the visitors. The granite figure of the presiding goddess in the Birla Mandir at Hyderabad is about 11 feet tall. There is an engraved lotus that serves as an umbrella to the presiding deity. The companions of Venkateswara, Padmavati and Andal, are housed in different memorial section in that temple. There is also a temple dedicated to Buddha in this complex, with wall paintings describing his life and work. There are many striking carvings in marble in the mukha mandapam of the temple. These carving are finished with beautiful spotless marble which depict scenes from the Indian mythology. People when once cross the threshold are clearly transformed and walk around in a pious daze. Carving of Vamana, Buddha, Parasurama, Krishna, Mahavir, Chaitanya etc. are being embellished all around the structure. A brass pillar ascends to over 50 feet, and within is the black granite statue of Balaji, wrapped in silks and jewels, hidden away in the dark shelter created by what is exterior, an alluring sun-drenched gopuram. To enjoy the history and architecture of Birla Temple, a visit to the temple is a must during night. At night, this whole place gleams with soft lighting, creating the combined effect of composed and pure God welcoming visitors from their dark surroundings. There is a mezzanine sit-out where people sit on heels and rest before leaving. Visitors can also take delight in visiting large store on their way out, which sells interesting religious books and various pieces of art related to this temple. The mandir has around 8,000 to 10,000 devotees and on weekends it increases to more than 20,000 devotes. During festivals like Dusshera,Ugadi, Ekadashi, Sankranti, etc, more than 50,000 devotees visit the temple. Devotees are frisked, and mobile phones and cameras are not allowed inside the temple. This temple is attractive and beautiful; a sacred place where one can find peace and solace. 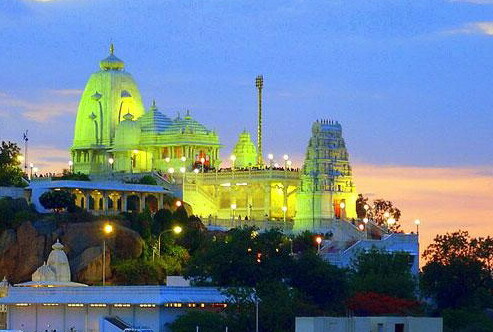 A tour to Hyderabad is considered incomplete without a visit to the charismatic Birla Mandir. If you are planning to pay a visit to the temple and offer your prayers then you should be up early to avoid the rush. The temple opens its doors at 7 in the morning till noon and again from 3pm to 9pm.